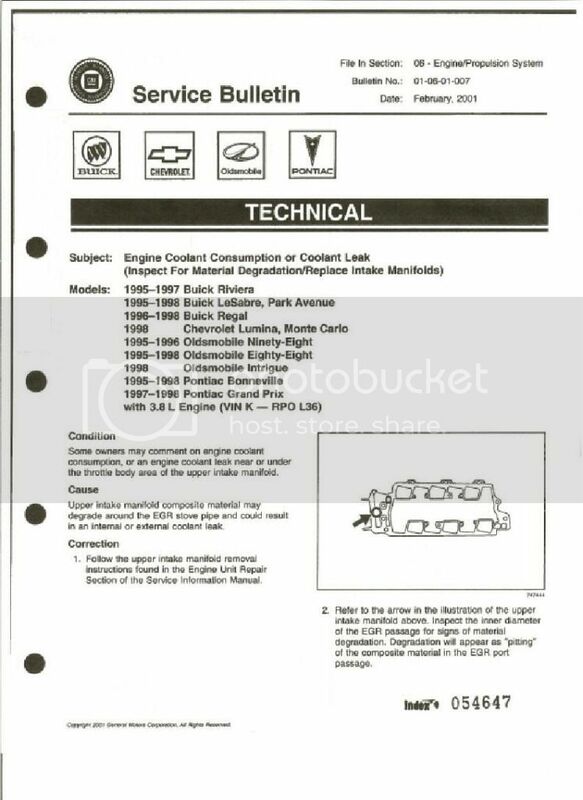 Here are the pertinent facts about this Buick LeSabre 1998 Limited -- which I got in August with 38,000 miles and now has about 45,000. I am new to DIY on vehicles and bought this in part because I want to learn and willing to try with so little invested (paid $2,400 for it). 1) For about the last 2,000 miles, ever since the only extended trip I have taken (250 miles each way over Christmas), the p0171 code showing lean bank 2 comes on and off -- 65% of the time on, 35% off. It always comes on within 5-10 miles of filling up the tank. It almost always disappears at about a 60%empty/40%full. 2) Last oil change, it was clear that oil is being lost somewhere but NOT from the gasket or drain pan. Seems to be in internal leak. Absolutely no oil drips onto driveway, parking lot, etc. So it must be leaking very lightly internally while engine is running and in motion. 3) Recently, the CHANGE OIL SOON light has come on and stayed on -- according to the manual, the computer does detect when oil has degraded. Although it was not the CHECK OIL LEVEL light, I did see was almost a quart low and so I have topped it off. 4) While I believe this could be the intake manifold gasket issue, I have sprayed and sprayed with carb cleaner and noticed no difference in rpms. In general, the car does not idle roughly -- seems very normal to me. No real issues at all, in terms of noticeable symptoms. Appreciate any further thoughts on this. My other issue is that relationship with very trustworthy regular mechanic for years has been very much -- "you just do whatever it takes". So while certainly it's possible for me to adjust the relationship to "diagnose for me and i'll fix it myself," his is not the type of shop where that's customary. Make sure upstream O2 sensor has a good connection first for the Bank 1 too lean code. Low mile, low use maybe for many months at a time vehicles like that might still have very real engine problems unknown right now. You just got it so I'd give it some time to see and do keep checking manually the oil level and have oil with you. It must have sat and now these 500 mile round trips it actually might use some oil - just maybe some flaws on cylinder walls I personally would ignore alone if no smoke seen and no drips or wetness anywhere can be found. Does it run properly, idle properly? Any other fluids low or mixing like is coolant oily? Good one by Hammer Time - I do recall these eat up manifold gaskets. Forgot you asked about the "Change Oil" reminder. I also forgot how you reset that one and just look in owner's manual. It's something silly like a tiny button with paper clip you hold for so many seconds or similar to that and it will say so. Low oil lights plain fail and do NOT usually know or warn of the ONE QUART low but rather more than that. It's personal to me but hate that as then you rely on it too much and never know when or if they fail!